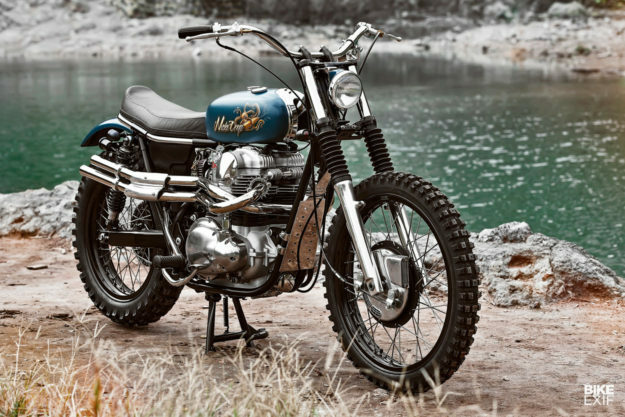 What if … Kawasaki had built a scrambler"
This stunning W650 hints at the missed opportunity. What if Kawasaki had got down and dirty with its W series in the 60s and 70s" Machines that, after all, were copies of a BSA. Mark’s also tweaked the stance for a scrambler vibe: It sits a little higher now, with a 21? front wheel in place of the original 19? unit, and a new set of Koni shocks out back. The rear wheel still measures 18?, but both wheels are actually new. The guys built them up using vintage Triumph T120 drum brake hubs, stainless steel spokes, and rims from the Mark Motorcycles store stock. That front brake is a stunner, but all the trick engineering is happening out back. The T120 originally used a left foot brake?so the crew built a linkage to operate the left side brake with the W650’s right-side pedal. Mark also rewired the W650, repacking everything into a discreet battery box under the seat. The ignition’s been relocated, and there’s no speedo, leaving the cockpit very sparse. New parts include 1? bars, modded levers and basic switches?all from the Mark Motorcycles store. The headlight’s a small 4.5? unit, mounted on a custom bracket with a petite cowl finishing it off. A side mounted tail light and a full complement of turn signals round out the lighting package.